XV. Does Toxoplasma cause schizophrenia? | Frozen Evolution. Or, that’s not the way it is, Mr. Darwin. A Farewell to Selfish Gene. XV. Does Toxoplasma cause schizophrenia? The fact that Toxoplasma’s manipulatory activity is most likely enabled by changes in dopamine levels in the brain of its host, is quite intriguing. It could also explain the long-known relationship between toxoplasmosis and the serious psychiatric illness of schizophrenia. Already in the mid-20th century, it was described that toxoplasmosis is usually much more prevalent among schizophrenics than among people without this disease. To date, there have been dozens of independent studies published on this topic. Furthermore, it has been found that patients with more serious cases of acute toxoplasmosis often show neurological and psychiatric, though usually transitory, signs which would otherwise be characteristic of schizophrenia. The reason I mention the discovery that Toxoplasma increases dopamine levels, in relation to schizophrenia, is because of the widely-accepted 30 year-old dopamine hypothesis of schizophrenia. This theory states that schizophrenia, which currently afflicts about 1 in a 200 people (63), is caused by an imbalance in dopamine levels in the diencephalon and telencephalon. The role of toxoplasmosis in the development of schizophrenia is definitely not yet proven, and other factors are certainly involved. Nevertheless, there are strong indications that toxoplasmosis could play a key role. At the very least, the statistical association between toxoplasmosis and schizophrenia is stronger (hah!) than that between schizophrenia and any genetic factor described to influence the risk of the disease (64). Edwin Fuller Torrey is not only a psychiatrist, but a publicly known figure with highly unorthodox, and – in today’s politically hyper-correct America – fairly controversial views. In his best-selling books he doesn’t try to hide his opinion that the term “former patient with schizophrenia” is a nonsensical euphemism; or that involuntary treatment with antipsychotics should be administered, even for treatment at home, to those patients whose health condition requires it. While advocates of patient rights may disagree, his arguments are apparently convincing; in several cases, he’s managed to influence the legislation. He also claims that truly serious psychiatric diseases are but rarely induced by the patient’s social environment. Usually they have biological origins. Biological causes include genetic predisposition, as well as infectious agents (such as Toxoplasma in the case of schizophrenia). Last but not least, Torrey’s books are well written. After reading one of his books, multimillionaire Stanley, whose son fell prey to manic-depressive psychosis in the 80s, contacted Torrey and provided him with the resources to establish an independent research institute for the study of schizophrenia and manic-depressive psychosis (today it’s more commonly known as bipolar disorder, so that the patient and his surroundings won’t freak out at the term “psychosis”). Furthermore, Stanley funded the establishment of a grant agency that would support this research. In 2003, the Stanley Medical Research Institute already had an annual budget of 40 million dollars, and in 2004 it financed half the studies on bipolar disorder and a third of the studies on schizophrenia in the United States. And that was just in the US. At the time, Stanley’s foundation financed a number of studies world-wide, including one of my smaller project in Prague. So it seems that sometimes it pays off to express one’s unorthodox views. I’ll have to think long and hard, about where I’m going wrong. Maybe the problem is not in that my ideas are too orthodox but rather in that our multimillionaires and potential sponsors are currently otherwise occupied, and, above all, reside in exotic places (like the Bahamas, the South African Republic, Switzerland...) where the poor guys never get a chance to read my books. in their host. If the immune system recognizes the presence of an infectious agent, the body begins synthesize an enzyme which breaks down this amino acid. Products of the break-up, namely 3-hydroxykynurenine and kyneuric acid, bind to neurotransmitter receptors. It’s thought that these raised levels of kyneuric acid, observed in schizophrenics, could play an important role in the origins or manifestation of the disease. In the last decade, British and American authors found that certain psychopharmaca, used in the treatment of schizophrenia, inhibit the reproduction of Toxoplasma in vitro – and this inhibition proved to be very strong and highly specific. These authors showed that some of the ethological and behavioral manifestations of toxoplasmosis in Norwegian rats can by blocked with psychopharmacological drugs normally used to treat schizophrenia or manic-depressive psychosis. The longitudinal study on American soldiers also brought interesting results. These soldiers regularly give blood samples, so it was possible to determine whether (and when) each of the 180 soldiers released from the army due to an out-break of schizophrenia had begun releasing Toxoplasma antibodies into the blood. The results showed that the released soldiers exhibited these antibodies suspiciously often, and that it occurred just before the outbreak of schizophrenia (65). Of course we can’t expect that schizophrenia has only one cause, and that being infection by Toxoplasma. It’s obvious that schizophrenia is not malaria; clearly, a number of genetic and non-genetic factors are involved in its development. Nevertheless, several independent studies show that in at least some cases, toxoplasmosis plays an important – and maybe even crucial – role. We began studying the relationship between toxoplasmosis and schizophrenia fairly recently. Collaborating with Jiří Horáček, David Holub and Lucie Bankovská-Motlová, we obtained slightly different results than previous authors. Above all, we didn’t prove that there was a higher prevalence of toxoplasmosis among our schizophrenics than among the normal population. It is possible, however, that this could have been caused by pre-selection – the sieve effect. We were only allowed to include schizophrenics who agreed to participate in the study. This likely eliminated the patients with more serious clinical signs, who would be less willing to participate; and these may have been the people whose schizophrenia was induced by toxoplasmosis. Past experiments included all the schizophrenics in a health institution, or those who had at some point sought medical aid, or experienced an attack of schizophrenia. These experiments would not have suffered from the sieve effect; they included people with all forms of schizophrenia. From the perspective of protecting patient rights, the current approach of respecting a patient’s wish not to be included in a study is justified; but from the perspective of research studies (which could bring improved treatment for schizophrenic patients), this approach, put mildly, is somewhat unfortunate. Fig. 36 Differences in the age at which Toxo positive vs. negative patients were hospitalized with schizophrenia (usually one year after the actual onset of disease). The graph demonstrates that both men and women uninfected by Toxoplasma, on average, are diagnosed with schizophrenia between the age of 23 and 24. Toxoplasma infected women are diagnosed with schizophrenia later – around the age 26 to 27. In contrast, infected men are hospitalized sooner (before they are 23 years-old). This observation coincides with the fact that in Czech Republic, men are infected with this parasite sooner than women. These results suggest that a certain number of schizophrenia cases might be induced by Toxoplasma infection. women there is an increased prevalence of toxoplasmosis around the age when women start setting up families, cooking more and dealing with raw meat. If we presume that schizophrenia can develop either in relation or not in relation to Toxoplasma infection, we can expect that schizophrenia will appear earlier in Toxo positive men and later in Toxo positive women than in Toxo negative people (for whom schizophrenia development is presumably age-independent). And ourstudy confirmed precisely this hypothesis. In addition, Toxo positive schizophrenics (men and women) were, on average, hospitalized longer than the Toxo negatives. Our results therefore indicate that schizophrenia associated with (or maybe even induced by) toxoplasmosis represents an independent (a perhaps more serious) category of psychiatric disorders. Fig. 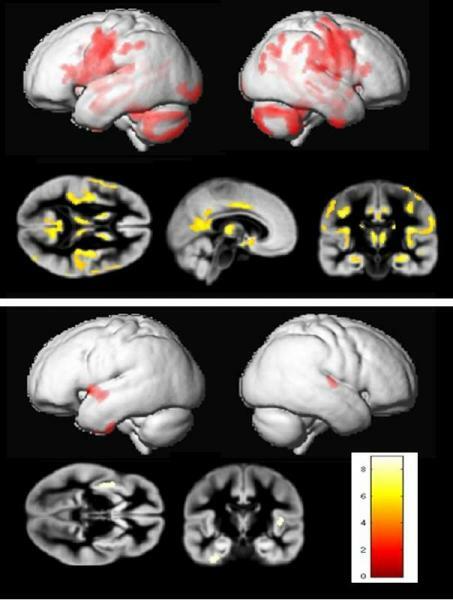 37 Differences in the brain morphology of Toxoplasma negative and positive schizophrenia patients (top picture) and healthy control people (bottom picture). The areas of smaller size or significantly lower density are indicated in color. The brains of uninfected and infected non-schizophrenics are almost the same, whereas the brains of uninfected and infected schizophrenic patients manifest a number of mostly degenerative changes. The most probable explanation is two different diseases are behind schizophrenia diagnosis; the first is not associated with morphological changes of the brain, and the other, perhaps more serious disease is associated with these changes and also with infection by Toxoplasma. The second possibility is that toxoplasmosis substantially worsens the course of schizophrenia. Images by Jiří Horáček. indicate that the schizophrenia of Toxo positive people differs from that of Toxo negatives; only the schizophrenia of Toxo positives is associated with anatomical abnormalities in the brain. Basically, there exist two possibilities, both clinically significant, which could explain these findings. Either toxoplasmosis worsens the course of the disease; or it may even induce one of the more serious forms of schizophrenia, which requires longer hospitalization and is associated with anatomical abnormalities in the brain. In another study, working with David Holub and Lucie Bankovská-Motlová, we administered various cognitive and performance tests to schizophrenic patients of the Prague Psychiatric Center, to see if the Toxo positive and negative subjects performed differently. Furthermore, we were interested to see how the Toxo positive and negative patients would react to schizophrenic treatment, as well as to a training program aimed toward increasing their performance (Box 67 What is the difference between the paired and unpaired t tests, and why is the paired one better?). Definitive results for the second half of the study are not yet available; in any case, we were not able to prove a difference between the Toxo positive and Toxo negative patients in the first tests, before the treatment and training programs. This, however, could have also been due to the sieve effect. It’s quite likely that mostly patients with less serious forms of schizophrenia, whether they be Toxo positive or negative, would have been willing to participate in our study or even in the training program. Box 67 What is the difference between the paired and unpaired t tests, and why is the paired one better? If we’re studying the effect of a certain factor on a dependent variable, such as the effect of a training program on the results of the schizophrenics’ performance tests, we can theoretically use two types of analysis tests – a paired or an unpaired test. An unpaired test compares the average performance of a group of people exposed to the given factor, with the performance of the control group, which was not exposed to the given factor. A paired test compares results using pairs of individuals; the two individuals somehow fit together, and within each pair, one individual was exposed to the factor, and the other was not. Each pair is formed by fitting together the two individuals who were originally the most similar (before one was exposed to the given factor). They might be the same age, the same gender, come from the same city or both be smokers or non-smokers. For each pair, we subtract the control individual’s dependent variable value from the other individual’s dependent variable value. If the studied factor had no effect on the individuals, then the average difference of all the pairs should equal zero – which one can easily test using the (very sensitive) one-sample test (see Box 63 How to compare photographs using one-sample test, and do we like self-similar faces?). In an ideal scenario, a pair is made up of the same person twice – before he was exposed to the factor, and after he was exposed to the factor. Here, the individual acts as his own control. This often occurs in experiments, but generally not in observational studies (with the exception of longitudinal studies, see Box 41 Longitudinal and cross-sectional studies). In such an experiment, we obtain the data by first measuring the parameter we’re interested in for each individual. Then we expose all the individuals to the studied factor, and once more measure the parameter. For each individual, we subtract the first value of the parameter (before exposure to the factor) from the second (after exposure to the factor). Using the one-sample test, we ascertain whether the average difference cold be equal to zero (which would mean that the studied factor either had no effect on the given parameter, or that it influenced the parameter positively in some individuals and negatively in others). The arrangement where each person acts as his own control, is useful because it filters out the influence of unknown variables, which often confound results. The paired test is actually as special case of the repeated measures tests. The same object or individual is measured several times, and then, using the repeated measures ANOVA, three things are determined. The first is the statistical significance of the so-called between subject effect (for example, whether a Toxo positive versus negative person differ in the studied parameter, e.g. reaction times). The second is the within subject effect (for example, whether there is a difference in the studied parameter from measurements performed on the same individuals at different times after exposure to the studied factor, toxoplasmosis). Finally, the analysis test determines the interaction between the between and within subject effects (whether a Toxo positive versus Toxo negative person reacts differently to the factor over time; for example, whether performance worsens more quickly in Toxo positives than in Toxo negatives). Inhibiting the reproduction of Toxoplasma (72). Maybe even more interesting is that the same antipsychotics, when given to mice and Norwegian rats that had lost their natural fear of the scent of cat urine after Toxoplasma infection, were able to inhibit this “defect” (73). The possible effect of toxoplasmosis on the onset of depression could also help explain the greater risk of suicide among infected people (74). The onset of depression could be influenced by decreased levels of serotonin in the brain, which, along with tryptophan, get broken down more quickly as part of defense against parasites. Toxoplasmosis may also play a role in migraines (75). However, we must admit that there are results which call into question a direct role of toxoplasmosis in various mental illnesses. For example, a recent study by Turkish authors shows that the risk of schizophrenia significantly correlates with the presence of Toxoplasma antibodies (indicating latent toxoplasmosis). But after statistically filtering out whether or not the person had come into contact with a cat, this positive correlation disappeared – actually, a slightly negative correlation took its place. This suggests that schizophrenia is more likely induced by a different pathogen spread by cats; the occurrence of toxoplasmosis only signifies that the person came into contact with a cat and the other, still unknown parasites it transmits. Research by German scientists has similar results – it also shows that the correlation between toxoplasmosis and schizophrenia disappears after statistically filtering out contact with cats (68). I must admit, that if not for our own studies on anatomical abnormalities in the brains of Toxo positive schizophrenics, I’d have serious doubts about a direct role of toxoplasmosis in the development of schizophrenia. As it is, I only have reasonable doubt (see Box 48 One can never be too careful...).